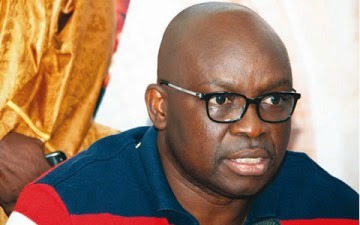 The 19 All Progressives Congress lawmakers in Ekiti State House of Assembly have urged a Federal High Court, Abuja, to establish a contempt charge against Governor Ayodele Fayose for allegedly manipulating its ruling. They warned that impunity and manipulation of facts of his impeachment case in the media could not save him. The lawmakers were reacting to media reports on the ruling of the Federal High Court in Abuja which refused Fayose and seven Peoples Democratic Party lawmakers’ request which sought to bar APC lawmakers from continuing impeachment process against the governor. Special Adviser to Speaker Adewale Omirin, Wole Olujobi, said in a statement on Saturday that the APC lawmakers were surprised that the governor and his men could deliberately misrepresent the fact of the ruling to mislead the public. “It is incredible that the governor and the PDP lawmakers could manipulate the press again to mislead the public that the ruling by Justice Evoh Chukwu was in their favour. “While the judge clearly ruled that it could not stop Fayose’s impeachment without hearing from the APC lawmakers, the governor’s storm troopers went to town in a contempt of court to turn full circle the ruling by the judge,” the statement explained. The statement added, “He first raided the courts and chased the judges under their tables and subsequently closed the courts. After that, he closed the House of Assembly and chased the lawmakers out of town. Fayose, who reacted through his Chief Press Secretary, Mr. Idowu Adelusi, said he would not dignify the APC with a response. He said, “We are not interested in joining issues with them on the pages of newspapers on the court ruling since we know and everybody knows the type of character the APC lawmakers are.